Ear wax is an ear cleaning powerhouse solution. Cerumen (the scientific word for ear wax) traps dirt and dust entering the ear canal, preventing it from sliding deeper down where it could get impacted and block your ear drum. The ordinary daily mechanics of yawning, chewing and talking moves the dirty ear wax out of the ear canal so you don’t have to do anything except take a regular shower. 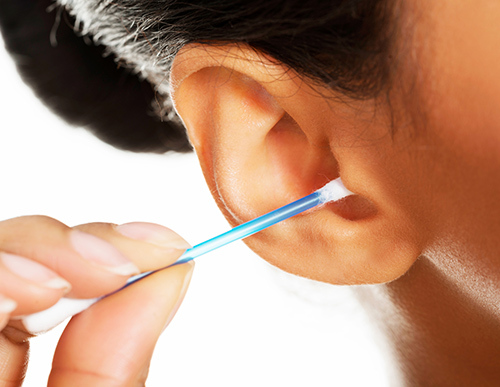 Using a swab, finger, key, chopstick, fork or any other foreign object for ear wax removal actually reverses your ears’ self-cleaning mechanisms, pushing old ear wax deeper into the canal where it can get impacted and cause hearing loss. Sure, cerumen may look gross, but your ceruminous and sebaceous glands make it for a reason. Besides ushering dirt and dust and crud out of your ears, ear wax protects your ears against fungal infections, viruses, bacteria, and even deters insects! It also protects and lubricates the inside of the ear canal to keep it healthy.